I love California, with its green trees and golden, grassy hills. I love its desert and its two great cosmopolitan cities. But I know that the state isn’t perfect. There are earthquakes, bad air and traffic. And there is the problem of Carmel: A worm in the apple. This is like being in love with a beautiful woman and hating her taste in gaudy gold necklaces, for Carmel, like jewelry, is about money. It reminds me of Beverly Hills with a view, all shops and wealthy wives promenading in the tree-shaded sidewalks with their Lhasa apsos. It is a shame, because the area is one of the coast’s most beautiful. 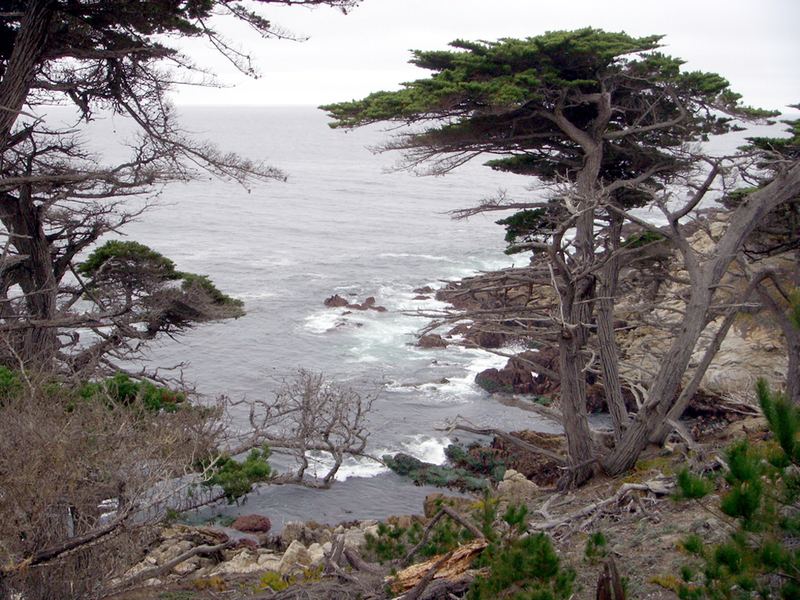 The churning sea whips granite rocks topped with arthritic Monterey cypress trees. Yet its residents have turned Carmel into a kind of Disneyland for the Gold Card. Fake Tudor storefronts mix with artificially quaint habits, such as the lack of street addresses and mail delivery. City fathers have banned fast food to the fringes of town, but they have been less inclined to stem the spread of Armani shops and Ralph Lauren boutiques. As a row of greedy storefronts waiting to pick your pockets, there is little difference between Carmel and a Mexican border town except the income levels. 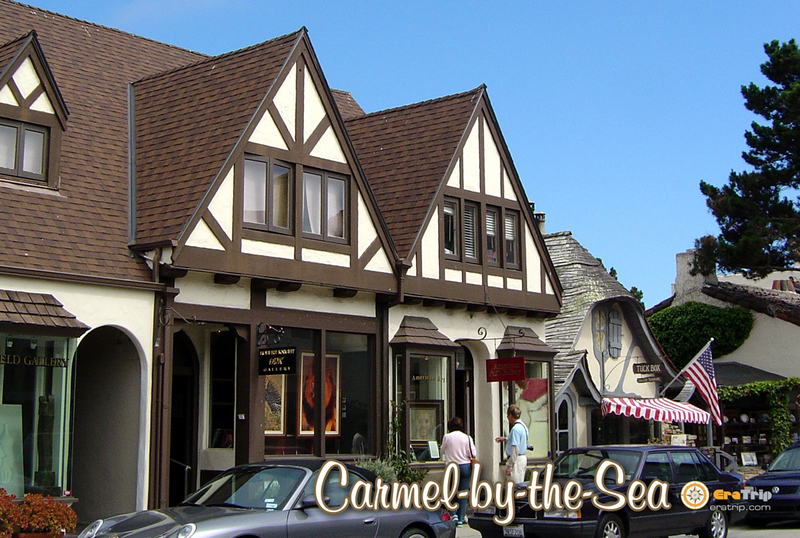 At one time, Carmel was something of an ”artists’ colony.” Before it was priced out of their reach, the town was home to writers such as Jack London, Mary Austin and Sinclair Lewis. Poet Robinson Jeffers built a stone house and wrote about the wind-swept ruggedness of rock and ocean. Painter Maynard Dixon lived there for a while, and photographer Edward Weston made Carmel his home. Now, there are many art galleries, but precious little art. Most of what is for sale are little more than expensive souvenirs, and just as tasteful in their way as Statues of Liberty with thermometers stuck in their ribs. Traffic, especially on weekends, is gridlocked. People want to see what there is to see, hoping that includes former Mayor Clint Eastwood. 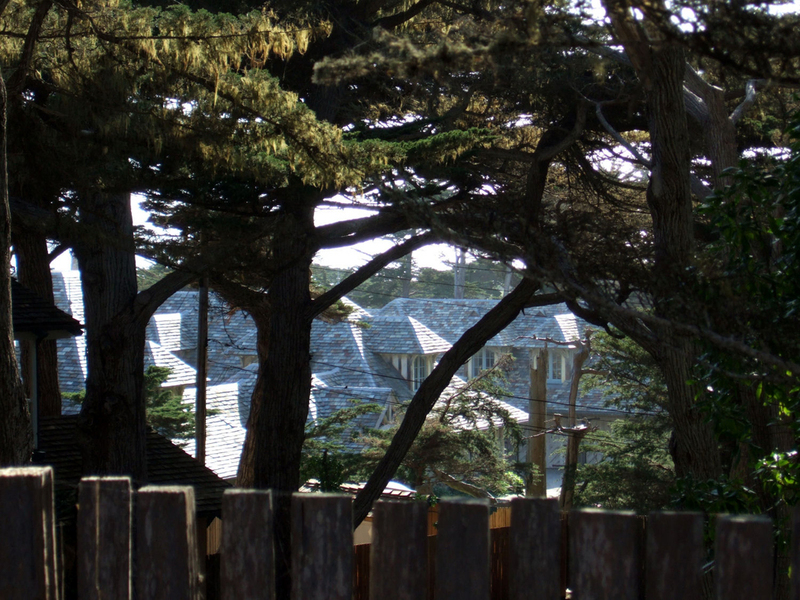 And if they continue farther north and pay the hefty toll — as much as a full-price movie ticket — to drive the famed 17-Mile Drive, what they will see for more than half of those miles are the fenced-in back yards of the wealthy. 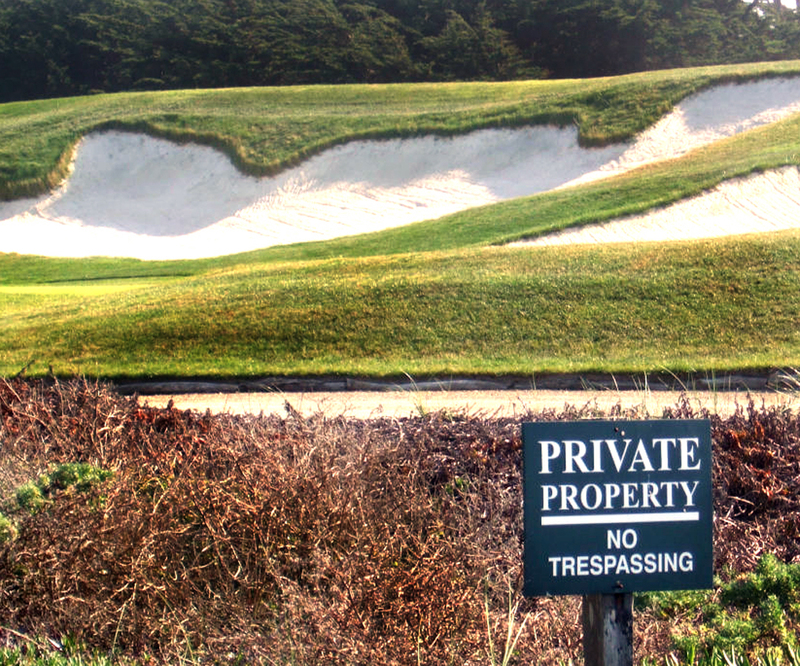 The road finally breaks out along the coast, where you can see the twisted Monterey cypress trees and the surf-bashing rocks, but you also see one golf course after another, with all kinds of ”Keep Out” signs. Pebble Beach is only the most famous of the courses. 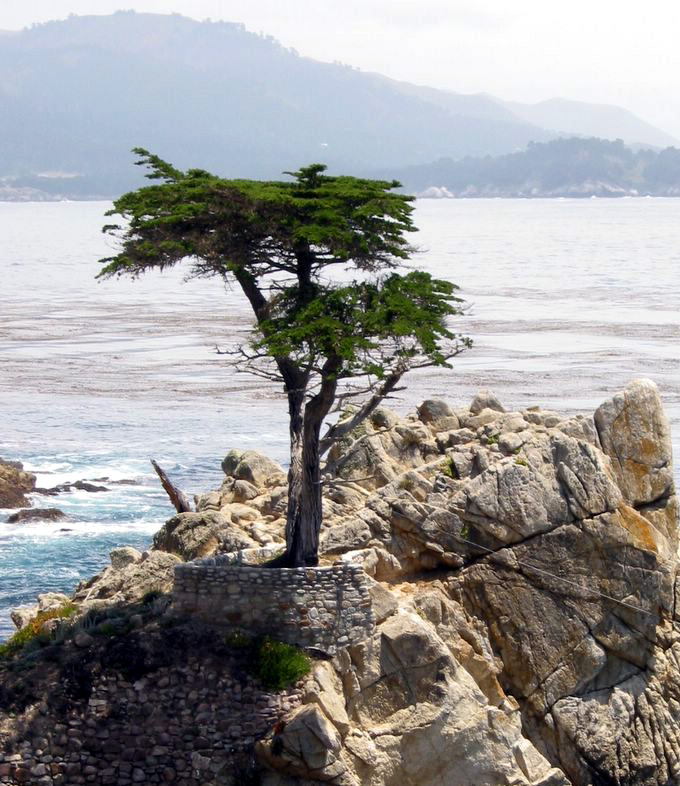 Those millionaires managed to buy up most of the peninsula and privatize it, which means they even can threaten to sue anyone taking pictures of their ”Lone Cypress” that hugs the rock along the Drive and has become the trademark for the Pebble Beach Co. Working artists are not even allowed to make a painting of the tree without ”prior written consent of the Company,” according to the brochure. The company employs a ”director of intellectual property” to make sure no one misappropriates their tree. The whole thing feels mean-spirited. No one can take the joy out of living like a lawyer. Passing on another mostly travel blogger’s view, of coastal California. I have similar impressions of the region by Monterey. So did Steinbeck. I discovered Richard’s work, like most wordpressers, through our shared blog platform. He’s a good read.